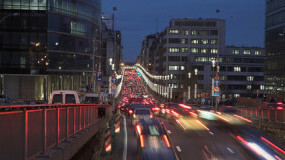 Brussels is one of the most congested and least pedestrian-friendly cities in Europe. Behind the visible harm that is provoked by this situation of heavy car traffic, lies an unrecognized « invisible harm ». It deprives the people of Brussels from something that might be even more important that their money, time and nerves : it makes them lose opportunities to meet other people. The first study which has shown evidence of a negative link between car traffic and social capital, was conducted more than 30 years ago, by an american urban designer called Donald Appleyard. His study, which was made in San Francisco, revealed that the people who lived in light traffic streets were more likely to meet their neightbours than those who lived in heavy traffic streets. Those who lived in light traffic streets were also more likely to have many friends around them and to have a larger vision of their « home territory » (i.e. they felt at home in their neighbourhood). It’s quite logical, isn’t it ? A heavy traffic place (such as Chaussée de Louvain) is a place you want to escape from. And very light traffic place (such as Place Gaucheret) is a place that gives you energy, and a place you want to live in. Les piétonniers à Bruxelles : la convivialité à tout prix ?